We cut our teeth on the automotive industry by serving the Big Three and other well-known global nameplates. Dealing direct with the manufacturer, OEMs, and all Tier supplier levels — we’ve turned out precision parts for transmissions, seating and window components, safety restraints and brake systems, even trailer hitches. These highly sophisticated customers appreciate our respect for their timetables, their specifications and our ability to cut their vehicle production costs. 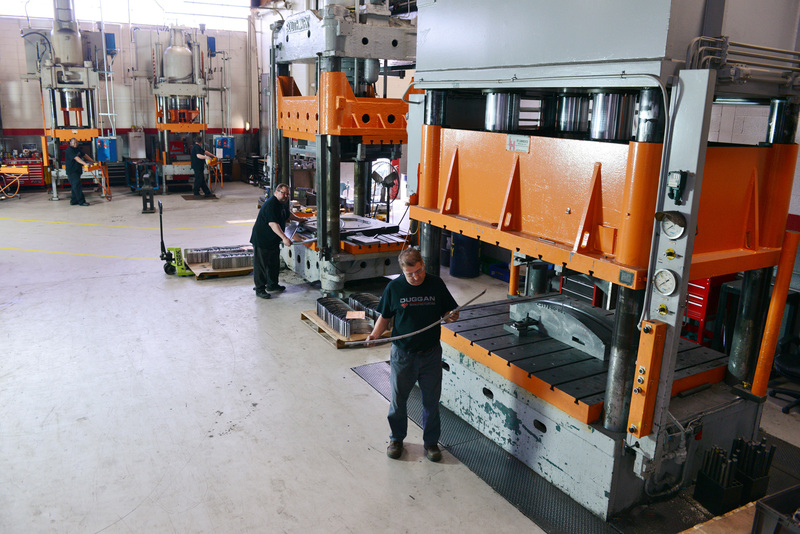 The professionals at Duggan continue to meet every challenge as today’s car and truck manufacturers face their daily challenges in their factories and marketplaces. Whatever your metal component needs, and whatever the times, you can count on us as an indispensable and enthusiastic team players. What every military man and woman deserves is unfailing equipment they can depend on and that’s delivered on time for them to successfully execute their critical missions. This is where focusing on the customer’s business and needs is uniquely crucial. At Duggan, we understand the dependability and time requirements of the military. That’s why we’ve dedicated a substantial portion of our 105,000 square footage specifically to defense orders. The size of the job is no issue with our huge presses (up to 1200 ton), ultra-modern laser components (4 kilowatt Mitsubishi Laser with a 45’ c 10’ automatic pallet makes for laser sharp cutting), Press Brakes banks of milling machines, lathes, and on-target accuracy of our modern welding robots. Our three shifts (24/6) get the jobs done and out the door — fast! With the greatest respect for the free world’s fighting men and women, all of us at Duggan take extra pride in our defense assignments. Precision can mean the difference between “all systems go” and “mission aborted.” That’s why aerospace industry customers make us their choice. They appreciate our meticulous attention to detail in light gauge metal forming, state of the art robotic welding and our CAD and laser-cutting technologies. They expect and receive our creativity and flexibility as we provide imaginative solutions for a full range of services from concept and pattern development to production and assembly. It’s our diversity of product offerings that allows Duggan Manufacturing to serve the many needs of the aerospace industry. These include but are not limited to intricate machined, drawn, stamped and assembled components, as well as casted products. The push to electrify vehicles is a big part of the work we have done over the past few years. The need for the various support components such as battery trays, bus bars and support plates has never been greater. We have been fortunate to work with many of the leading companies in the industry. This experience has given us an early expertise in problem solving the unique manufacturing issues presented through the use of exotic materials and stack up tolerances. Duggan has been a critical Tier-2 supplier to the agricultural industry for the past 17 years. We take pride that the companies we have worked for and have relied on our well-organized and customer-service focused approach. We also know that the industry is ever changing. Commodity prices and demand for agricultural goods can see large swings, affecting everyone in the industry. To ensure that your production schedules are kept intact, we keep production schedules in tune with yours and our lines of communication open at all times. In the home appliance industry, designs are constantly updating to meet consumer tastes and changing market demands. As a custom metal stamper, our metal forming capabilities can provide everything from small volume and prototype fabrication to low volume production. The construction and building materials industry is changing at a very fast pace. Builders, owners, designers and contractors are required to keep ahead of the competition by offering leaner and more efficient construction techniques. Call us for more information at 586.254.7400 or fill out our convenient RFQ form here. A Duggan team member can answer any questions that you may have about our manufacturing capabilities and services.